This French tribe of six has been roving the world with its heterogeneous and eclectic musical luggage for 25 years. Not a band, rather a caravan, a collective of incorrigible backpackers, tightrope walkers, globe-trotters, open to every experience and encounter. 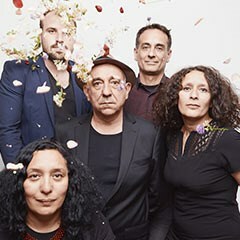 Through a dozen records, Lo’Jo’s gang has explored as many musical lines as continents resulting in a blend of gypsy, North African and French chanson styles influenced by jazz, punk and rock. Featuring vocals, keyboards, violin and kora, bass and drums this band continues to explore wild and beautiful music.